Pine Street Construction is committed to active community involvement, supporting and sponsoring a myriad of special events and non-profit organizations throughout the year. We invite you to learn about just some of the organizations we support below, as well as learn more about our own unique community outreach project, The 100 Wheels Project. We also recognize the importance of sound environmental stewardship. From architectural salvage and building material recycling to our support of Habitat for Humanity’s ReStore and other community organizations, we are committed doing our part to help the environment. In December 2008 we launched The 100 Wheels Project, an annual community outreach initiative designed to provide disadvantaged children in the community with brand new bicycles for the holidays. Each year we partner with local non-profit organizations to identify specific children in need. We then purchase 100 unassembled bicycles and host a community bike-building party with our employees, families and friends, then deliver the bikes to our partner non-profits. 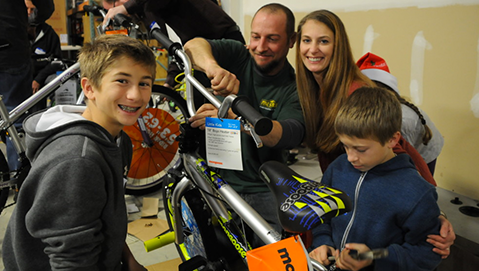 To date, we have donated 962 bikes to deserving children for the holidays. To read more about this project and learn how you can support this annual event through a donation toward a bicycle, helmet, or bike lock, please visit bikebuild.org.